Chef Boy is your own personal kitchen Santa! And make the Christmas mood even jollier with some rounds of Apple Cinnamon Brulee – a fitting ender for another joyful day when families get together! 1. Peel and core apples. Cut into bite sized chunks. Cook the apples in the cinnamon, ¼ cup sugar, and water. Cook for 7 to 8 minutes until tender, but not mushy. Set aside to cool. 2. Preheat oven to 325 degrees F.
3. Whisk egg yolks and 6 tablespoons sugar. Whisk until light yellow. Add vanilla. While whisking, gradually pour in whipping cream. 4. Divide apples evenly into 6 ramekins. Ladle cream mixture evenly over the apples. 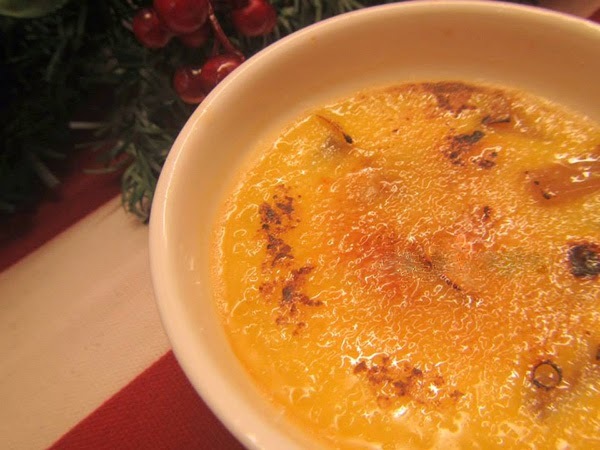 Place ramekins in a baking dish. Pour hot water halfway up to the sides of the ramekins. Bake the custard until set, approximately 40 minutes. 5. Keep the ramekins in the water bath and let them cool for about 30 minutes. Remove from water and chill overnight in the refrigerator. 6. Sprinkle sugar on top of creme and then torch until brown.